WHEN HUTTON finally delivered his long awaited report into the death of Dr David Kelly he would have would have retained more credibility if he had made some sort of pretence at even-handedness or impartiality. We had all seen and heard the evidence that was presented to the inquiry last summer – Hutton’s conclusions were a matter of interpreting that evidence. In the face of the evidence he found the Tony Blair and his clique totally innocent of any deception or improper behaviour, either in distorting the case for war against Iraq or in releasing Dr Kelly’s name as a whistle-blower. And he found both the BBC and Dr Kelly guilty – Dr Kelly of talking out of turn, “in breach of civil service guidelines” and the BBC for broadcasting the possibility that the Government had manipulated information given to it by the intelligence services to make a case for the illegal invasion of Iraq. This report indicted Hutton himself most of all; he fulfilled our worst suspicions that he was appointed to conduct the inquiry by Blair because he was a safe pair of hands. Blair is euphoric. The report was published less than a day after he had won a very narrow victory in the House of Commons in the Bill to raise university top up fees. That tiny victory was gained through the now familiar tactic of winning over one of the leading rebels at the last minute, in this case Nick Brown, throwing the rebel camp into confusion. Last February, on the close vote of going to war with Iraq, it was Clare Short who played the publicly conscience-stricken rebel, repeatedly changing her mind and so undermining the backbench revolt. Blair thinks he has got away with it, he thinks he has survived his two critical tests unscathed. He may be still standing but he is damaged. Labour has a majority in the Commons of 161. Yet only by threatening to go for a vote of confidence and bring down the whole Labour government was he able to intimidate enough backbenchers to win the vote on top-up fees. Many voted against their conscience only because they were afraid that the fight could end in a Tory general election victory. Blair has certainly not endeared himself to the people and the working class of Britain, to the unions, the students, or to many in industry. Blair’s decision in 2002 to back Bush’s illegal war on Iraq put him at odds with the United Nations and with Europe. Powerful forces in the ruling class still want him out and Hutton’s whitewash won’t placate them. Already we are seeing in the mainstream press many questions about Dr Kelly’s death, throwing doubt on the suicide verdict. A letter in the Guardian from three eminent medical scientists has pointed out that it was most unlikely that he could have died in the way described. Blair claimed that Iraq must be invaded because Saddam Hussein had weapons of mass destruction, which could be used against Britain within 45 minutes. It was a ridiculous claim and has been demonstrated to be totally untrue. 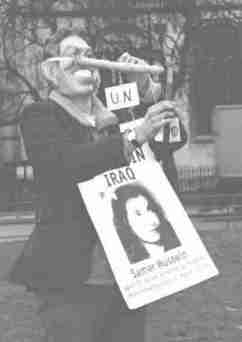 No banned weapons have been found nor any evidence of weapons programmes in Iraq after the end of the first Gulf War and the imposition of sanctions. Blair would not escape unscathed from an inquiry into his reasons for going to war. The war was all about Bush wanting to seize the Iraqi oil fields for his wealthy oil industry backers. It was pure theft and Blair was his accomplice. They must not be allowed to get away with it. They must both go. BUT WHAT A HOLLOW victory it was. Labour’s majority cut from 161 to five as over 70 Labour rebels voted with the opposition to try and block the university top-up fees Bill. The Labour leader’s credibility in the country is rock-bottom. His hold on the Labour Party is now solely based on his army of placemen who believe their careers depend on the prime minister’s political survival. But that too depends on Labour’s standing amongst the people – the millions who voted Labour in the belief that it would reflect the hopes and aims of the unions for a better life for working people – the millions Labour needs to win to secure another term in office. The fight to defeat Blair and his reactionary agenda was taken to the heart of government this week. It now must spread throughout the Labour Party and the trade union movement. Blair’s minions may have got what they wanted by brow-beating a sullen majority of their own ranks into agreeing to tear up their own manifesto pledges but the struggle to defeat Blair and all that he stands for goes on. George Galloway, the campaigning Scottish MP, was unjustly expelled from the Labour Party last summer for opposing Anglo-American imperialism’s invasion of Iraq. Originally he had intended to fight, like Ken Livingstone, for re-admission – but last autumn he decided to launch a new electoral platform to challenge Labour in the European and London regional elections this spring. Supported by the Trotskyite Socialist Workers Party (SWP), a handful of trade unionists and some prominent individuals in the British Muslim community, Galloway has established the “Respect – Unity Coalition” that was formally launched last weekend. Essentially Respect seeks to build a left social-democratic party to challenge Labour in the elections. Previous attempts have always failed. Arthur Scargill’s Socialist Labour Party is moribund. The Socialist Alliance – the SWP’s earlier throw – never got off the ground. And the British Road to Socialism, the revisionist doctrine that ultimately provides the ideological basis for these platforms, has been repeatedly spurned by the working class since its inception in the 1950s. Respect is calling on the millions mobilised by the anti-war movement to rally to its flag. In doing so it is essentially seeking to transform the peace campaign, which is supported by millions in the Labour Party, other parties or no party at all, into a movement that simply supports George Galloway’s platform. Respect seeks to divert the anti-war movement’ which involves all strata including those sections of the bourgeoisie opposed to the Iraq war into backing one small section of the anti-war movement led by a charismatic former Labour MP and the SWP. Respect ignores the fact that the fight-back is taking place within the Labour Party and the unions – and that is where Blair & Co can and must be defeated. Respect projects a left social-democratic agenda in opposition to Labour, deliberately cutting itself off from the labour movement, and refuses to acknowledge the fact that there is no demand for such a movement within left social-democracy today. Nor is there any support for this “alternative” amongst the working class itself.